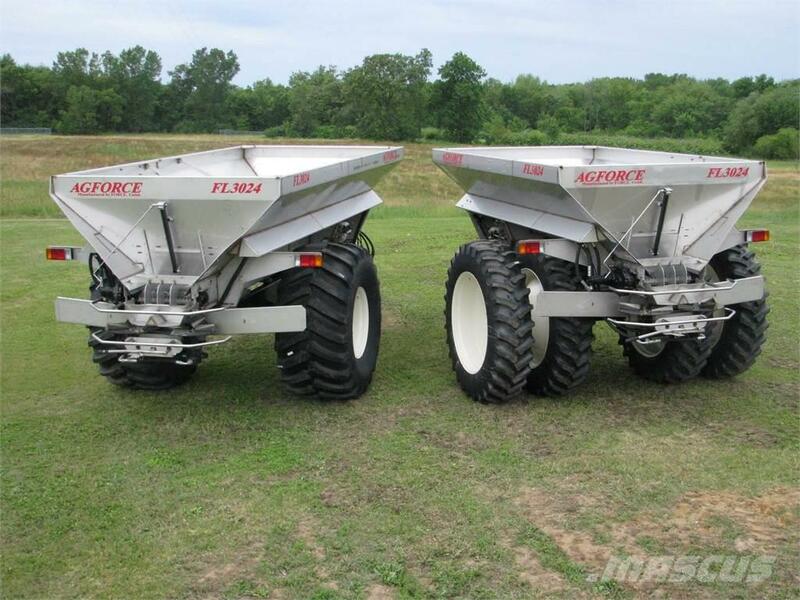 Brand new Ag Force 14 or 18 foot trailer Spreader. Single bin, easily could be updated to a twin bin Duo system ( for an additional charge) OR ADD OUR GRANULAR BIN AND GO UP TO 4 BIN. All 304 SS construction. 102” WIDE FLARED BODY, 30” WIDE CONVEYOR FRAME, 	TWO 24 INCH SPINNER SPINNERS. EXTRA HEAVY DUTY SPINNER MOTORS & HUB ADAPTERS WITH “LIFETIME” SHAFT SEAL LARGEST HEAVY DUTY SPUR GEAR CONVEYOR DRIVE IN THE INDUSTRY, RUBBER MOUNTING, SINGLE AXLE DESIGN BULL-PULL HITCH, CAT 4 IMPLEMENT HITCH, 1.5 AND 2 INCH DRAW PIN, HYDRAULIC BRAKES,REAR LIGHTS, AMBER FLASHING, BRAKE, AND BACKUP, W/ HARNESSES. INCLUDES THE OPTIONAL SS LADDER. 900/60R32 TIRES ON 94 INCH CENTERS – STANDARD TIRES. INCLUDES 12 INCH 304 SS. SIDE BOARDS. TOTAL 414 CUBIC FOOT CAPACITY IF LEVELED AT THE TOP OF THE SIDEBOARDS. 13.5 TONS OF A 65 LB. MATERIAL. ROW CROP TIRES ALSO AVAILABLE. 480/80R46 Dual Wheels & Tires and 12" Side Extensions. CAN SPREAD UP TO 90 FOOT IN FERTILIZER. 60 FOOT IN LIME- DEPENDENT ON THE PRODUCT. CAN BE SINGLE OR UP TO 4 BIN SPREADER. CAN INSTALL WEIGHT SCALES ON THE SYSTEM AS WELL! SEE PHOTOS. ** Note the photo of our Norwood Combo Seed and Fertilizer Tenders, see them under Norwood in New Equipment on our website. A great way to utilize a single tender for more than one season. Equipped with SS components to handle the daily use in both Seed and Fertilizer. Remote controls are standard & Scales can be added. the 400 unit tenders will hold 11.6 tons of Fertilizer.